21st match of ICC Worldcup 2015 has been played between New Zealand and Afghanistan at McLean Park, Napier today. New Zealand with good all round cricket still unbeaten in tournament and won against Afghanistan by 6 wickets with 83 balls remaining. 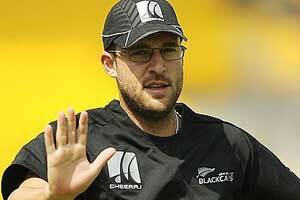 DL Vettori (New Zealand) declared man of the match for his tight bowling with 4 wickets in his 10 overs spending just 18 runs. Earlier, Afghanistan won the toss and decided to bat first and set target for New zealand. Opting to bat first, Afghanistan lost both opening batsmen very early in 2.1 overs. Other middle orders also failed to stood in middle for long and lost wickets in regular interwals. Samiullah Shenwari 54 runs and Najibullah Zadran 56 runs only played well for Afghanistan and managed to put 186 runs for New Zealand to achieved. Following small total of 187 runs, New Zealand as usual started well with MJ Guptill and skipper BB McCullum confidently. MJ Guptill made 57 runs and BB McCullum played quick inning of 42 runs just in 19 balls. Rest done by other middle orders and New Zealand won the mattch in 36.1 overs by 6 wickets.